Prototype: German Federal Railroad (DB) class Ka small locomotive. Version with storage batteries and electric traction motors on a diesel locomotive frame. 2-axle wheel arrangement. Built starting in 1935. Use: Switching service, switching cars at factory installations, hazardous materials cars. Model: Era III, the locomotive has a die-cast metal body and frame. It also has a digital decoder for DCC and Selectrix with automatic system recognition; the decoder can also be used in conventional operation. 5-pole miniature can motor with a flywheel. 2 axles powered. The headlights / marker lights are LED's. The headlights / marker lights can be controlled digitally. Separately applied grab irons. NEM coupler pockets. Length over the buffers 74 mm / 2-1/8. 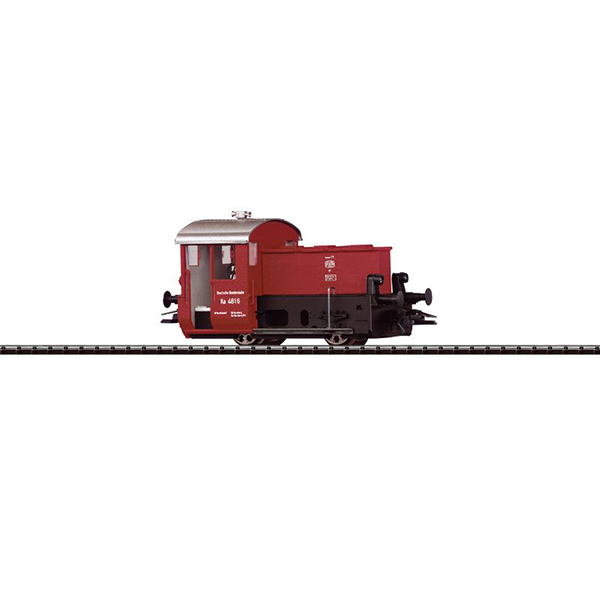 Quiet Railroad Dwarf - The German State Railroad placed a total of 41 small locomotives with storage batteries into service starting in 1937 parallel to the diesel powered Köf small locomotives. Externally they resembled the Köf II and had a similar power output. Two axle-suspended motors were installed for the drive gear. These exhaust-free and quiet units were preferred in switching work involving hazardous materials cars in yards and in maintenance facilities. These small switchers could be used with no problems at all inside factory buildings, where diesel exhaust gases would have been a problem. An AC version of this model is available in the Marklin assortment under item no. 36810.